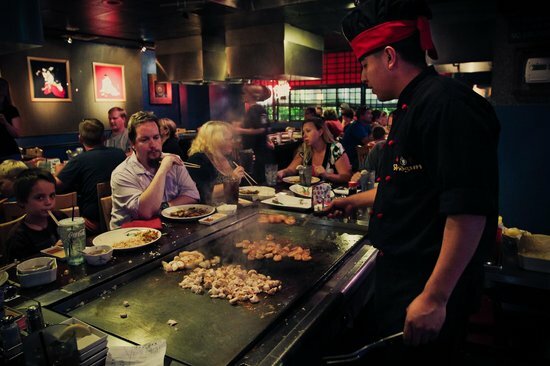 Dining in Branson can be enjoyed best if you eat at some of the restaurants such as Mel’s Hard Luck Diner and Shogun Japanese Steak and Sushi as they both offer live entertainment while you enjoy your meal. When you dine at Mel’s Hard Luck Diner, talented singing servers entertain you while you feast on their delicious food and famous desserts. This 1950’s era dining spot is home to professional singers, songwriters, and musicians. Many of them have been or are currently performing in some of Branson’s most popular production shows. So, if you want to enjoy a unique dining in Branson, stop by this place, sit back and enjoy great food while they sing your favorite songs. Your visit to Branson is not complete without eating at least one meal from Mel’s Hard Luck Diner, home of original singing servers in Branson. Many of the servers in this restaurant are award winning, two of them have even achieved high scores on American Idol. Mel’s Hard Luck Diner is a unique restaurant and you can’t go wrong when you choose to eat at this amazing dining place. Located right next door to the Grand Palace Theater, this eatery is a great place to enjoy a fun and delicious meal. The waiters and waitresses will dance and sing around your table as they serve themed entrees such as the Cheese Release Me grilled cheese or the Love Me Tender fried steak. Mel’s Hard Luck Diner also offers full service soda fountain that boasts 15 flavors of the bubbly concoction. They also have about 25 flavors of ice cream, sure to satisfy every sweet tooth. For over 20 years now, the talented servers of this restaurant have been singing your favourite songs while they serve great food. It’s really fun to dine at Mel’s Hard Luck Diner while being served by talented servers and listen to favorite songs performed live and up close. Shogun Japanese Steak & Sushi is another beautiful restaurant in Branson where foods are prepared by entertaining and talented chefs. When you dine in this Japanese restaurant, you’ll enjoy excellent food combined with a cooking show in front of you. Located at the Falls Shopping Center, Shogun Japanese Steak & Sushi offers steak, chicken, all kinds of seafood, and serves the freshest sushi in town. This beautiful dining spot in Branson has been serving locals and visitors alike for many years with incredible food prepared and served in an open-cooking atmosphere which makes your dining in Branson an unforgettable experience. Shogun Japanese Steak & Sushi employs skilled hibachi chefs that prepare an excellent variety of dishes for you to enjoy impressive Hibachi Dinner from Shogun’s fantastic menu of steak, chicken, seafood, and vegetable entrees, and more, including great combos, like Filet & Lobster and the Branson Marina, a tasty combo of shrimp, scallops, and calamari. So, if you want to experience an unforgettable dining in Branson, don’t miss to dine at Mel’s Hard Luck Diner and Shogun Japanese Steak and Sushi as they both offer delicious food and awesome entertainment.